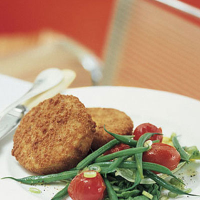 Golden fish cakes, roasted cherry tomatoes and fresh beans make a wholesome meal. Preheat the oven to 200°C, gas mark 6. Place the fish cakes on a baking sheet and cook for 30 minutes until golden, crunchy and piping hot. Meanwhile, place the tomatoes in a heatproof dish. Mix together the olive oil, vinegar and sugar, then season. Pour over the tomatoes and cook alongside the fish cakes for the last 15 minutes until the tomatoes split, but still hold their shape. Cook the green beans in a pan of boiling water for 4-5 minutes until tender, then drain well. Separate the lettuce leaves and slice the salad onions. Toss together with the beans and spoon over the warm tomatoes and their pan juices. Serve with the fish cakes.